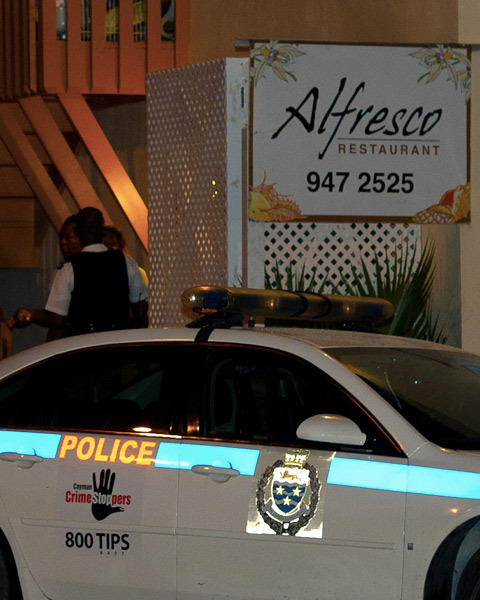 (CNS): Updated — Police are appealing to the driver of a black SUV that may have witnessed two gunmen as they made their escape from a robbery at Alfresco Restaurant in West Bay last night to come forward. The driver was forced to stop as the robbers ran in front of traffic as they fled from the scene and turned left into Townhall Road. The two gunmen held up staff at the West Bay restaurant Wednesday night and made off with an undisclosed sum of cash. Police said the men who were both carrying what appeared to be handguns entered Alfresco at around 9:46 when they pointed the gun at a female member of staff and demanded cash. The first suspect was described as tall with a muscular build, dressed in grey baggy camouflaged pants and black shoes. The second suspect was described as being shorter and wearing a black T-shirt. Police said that they were given no further description of the robbers but Detective Constable Nathan Turner says it is important that the driver of the car which could be a Ford Explorer, contacts West Bay CID as the driver may have seen the men. No shots were fired and no one was hurt according to the report in what is the second robbery at the restaurant in just over a year. The popular beach front West Bay restaurant p was also held up by two masked gunmen last year but no one has been charged for the crime. Sad to watch from across the pond as all the places I used to go to are the sites of robberies, violence and killings. Bad enough when I was there and people were being killed on the road that I drove on to get to my parking lot (I know you know the one), now the people can’t even go for a fish sandwich without risking getting caught up in this crime wave of violence. So sad for Cayman, but bitter-sweet happy that I’m not there to have to be afraid of it. Mac and the Governor are destroying your country people. one suspect without shirt ( camouflaged pants and black shoes) and the other suspect (black T shirt) without pants we assume ! you gotta love it ! Or Port Royal earthquake repeats itself. The thing about this robbery, this is happening right in the Premier's doormouth, just about a mile away, but the police only protects Boltin Avenue. I bet you just about 3 or 4 times a day, you can see that helicopter circling over Boltins to see if any criminals is near the Premier's residence and all they are really doing is spying in people's backyard to see what they are doing. What a waste of resources. Any wonder they cannot catch a criminal act taking place right down the road. Disgusting!! Those CCTV cameras sure came in handy! One right by the 4 winds Esso, next one right by the intersection of NW Pt and Town Hall Rd. Our $ hard at work. The RCIPS is pathetic. They know Alfresco has been targeted by theives before, so would it have not made sense to put a camera right there on one of those poles by Powell Smith Dr? I mean, do these cameras even work? XXXX Despite all the shootings and robberies, I'm still proud to be from West Bay. We young people need to speak up for ourselves. The 'government' does not care about anyone. And by extension, the RCIPS does not care. If you trust either one of these entities to protect you, you're sorely mistaken. The safety of Cayman would be improved if DART closed all the roads into West Bay. Too bad this headline didn't read "Two Armed Robbers Hit By Passing VehicleWhile Fleeing the Scene of the Crime". Why did the driver of this black SUV stop i ask?? Haven't you seen some of our plain clothes police running around with bulging waist? What do you think would happen to you as a driver and hit one of these police officers thinking that they are arm robbers who just commit a crime. We can't go around hitting people because we drive a SUV. l Leave the police to take care of the criminals and do not encourage any to take the law into their own hands. I take it you have inside information as to the skin tone – I hope you’ve shared with the police. As to the criminal being afraid of imaginary people, that’s gotta be a guess UNLESS YOU ACTUALLY KNOW THEM. On that basis, I’m calling BS on your entire post, with the fall-back position that you are an aider and abettor to the criminals, knowing who they are well enough to state their position on preposterous fables butnot identifying them to the police. There is a total break down in criminal activity. Our leader does nothing about it. It is not on his radar screen. West Bay has always had a serious crime problem and their politicians never ever care. This a failure of West Bay voters to hold their politicians accountable. You get what you vote for. Sad situation all around. Ah this seems like the same two at the CUC . One tall and the other shorter. Well Mr. Dart, Welcome to West Bay! You want it – you got it! Enjoy. Well if the suspect was "described as tall with a muscular build." I'm assuming he was from Norway because that is such a good description he couldn't be from anywhere else.